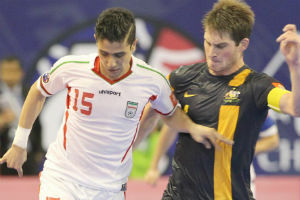 Hossein Tayebi scored a first half hat-trick as 10-time champions Iran recorded a third consecutive win at the AFC Futsal Championship with Sunday’s 8-1 victory over Australia at Phu Tho Stadium securing top spot in Group C.
Mohammad Taheri, Alireza Vafaei and Vahid Shafiei also scored for Iran in the first half, with Daniel Fogarty briefly equalising for Australia after Tayebi’s earlier opener. And with Ahmad Esmailpour and Taheri extending Iran’s advantage in the second half, Iran added to their earlier wins over Indonesia and China to set-up a quarter-final meeting with the runners-up from Group A.
Australia, meanwhile, will face the winners of Group A having seen their 100% recorded ended. “I think that the result came totally in the first half. In the second half I wanted to score more goals and play fast, but Australia were happy with the score,” said Iran coach Jesus Candelas. “We are going step-by-step and each game we are just trying to get a good result, but we have to win just to keep the mentality of the team positive. Having earlier beaten Indonesia and China, it took just 60 seconds for Iran to open the scoring as Tayebi followed up after Adam Cooper had blocked Asghar Hassanzadeh’s shot. But Australia found themselves back on level terms as Fogarty fired into the roof of the net from Tobias Seeto’s corner. Iran, though, regained the lead in controversial circumstances in the 10th minute as Shafiei crossed for Taheri to score with Australia calling for play to be stopped after a second ball had entered the field of play. And Iran doubled their lead when Shafiei saw his shot from a tight angle parried by Australia goalkeeper Peter Spathis straight to the feet of Tayebi to tap in his second of the game. Tayebi completed his first half hat-trick in the 11th minute when a long ball forward found him with just the Spathis to beat, and he kept his composure to side-step the goalkeeper and roll the ball into an empty net. Iran’s fifth goal arrived in the 15th minute when a clearance from Cooper fell straight to the feet of Vafaei who shot low through the legs of Spathis. And Iran went into the break with a five goal advantage when a loose pass from Greg Giovenali was intercepted by Esmailpour and Shafiei fired past Spathis. Esmailpour further extended in the 28th minute as he stepped inside onto his right foot before placing his shot into the bottom corner. And a minute later Esmailpour was again involved in Iran’s eighth and final goal as he played a one-two with Taheri who scored his second of the match. “We have very rarely played at this level and before the game the players were excited to play against such a quality team,” said Australia coach Steve Knight.